“I never thought a pasta filled with vegetables would be really delicious”, that is my initial reaction when I had a primavera before as the one I tried was really tasty and the vegetables were fresh and crisp. 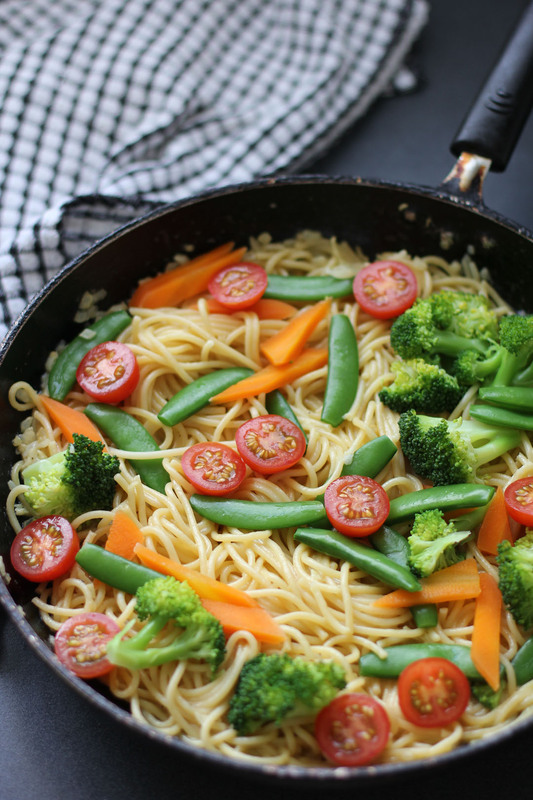 Pasta Primavera is an Italian pasta loaded with vegetables, having said that there is no real rules on what vegetables you can use in this dish and it all widely varied depending on the local vegetables available on your region. Commonly broccoli, zucchini, onion and mushrooms are the main stay together with a creamy cheesy sauce made out of a mixture of cream, Parmigiano-Reggiano and/or Pecorino-Romano. Cook your pasta according to packet instructions, drain then set aside. Drain the vegetables and drop them into a bowl of ice water, once the vegetable are cool, drain it again then set them aside. In large skillet heat butter then sauté garlic and onions. Pour in the chicken stock and white wine then bring it to a boil. Add the cream, pasta and vegetables. Stir to combine then simmer for a minute or until vegetables are hot. Add the Parmigiano-Reggiano and Pecorino-Romano, stir again to stir to combine. Season with salt and freshly ground black pepper then garnish with cherry tomatoes before serving. This looks so delicious! The veggies in particular look incredibly fresh and appetizing. Seems like a great summer (or spring to be more accurate) pasta dish. There’s something so wonderful about vibrant spring-like veg, in the height of winter! For me a pan of hot, cheesy pasta is the ultimate comfort food and your delicious picture has it in droves!!! Hard to pass up a good pasta! This is a good summer dish for us. I made Pasta Premavera for supper tonight, but yours looks so much better than mine! Your pasta primavera looks fantastic! So bright and fresh!